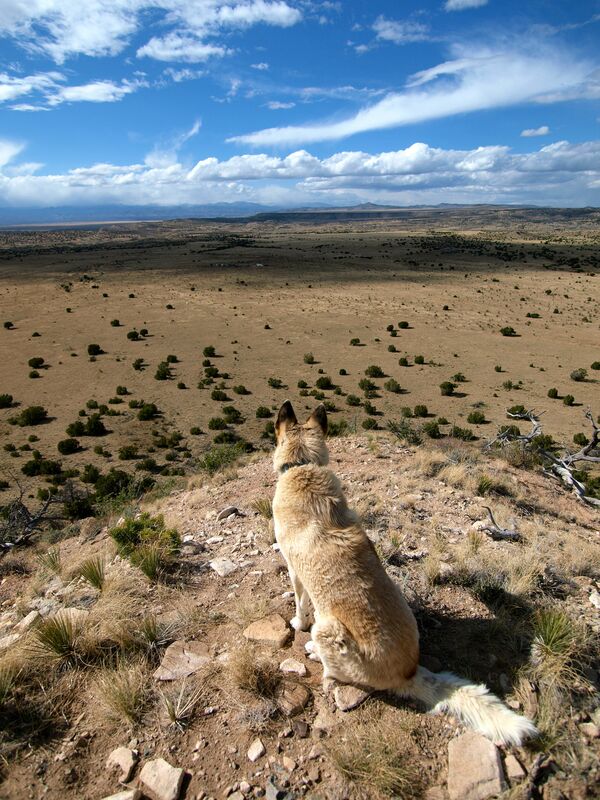 Coyote Dialogue- Freckles may be deaf but she's a fluent communicator. The flattened ears, submissive tongue and tail wag were all in response to my wiggling my fingers at her in greeting. 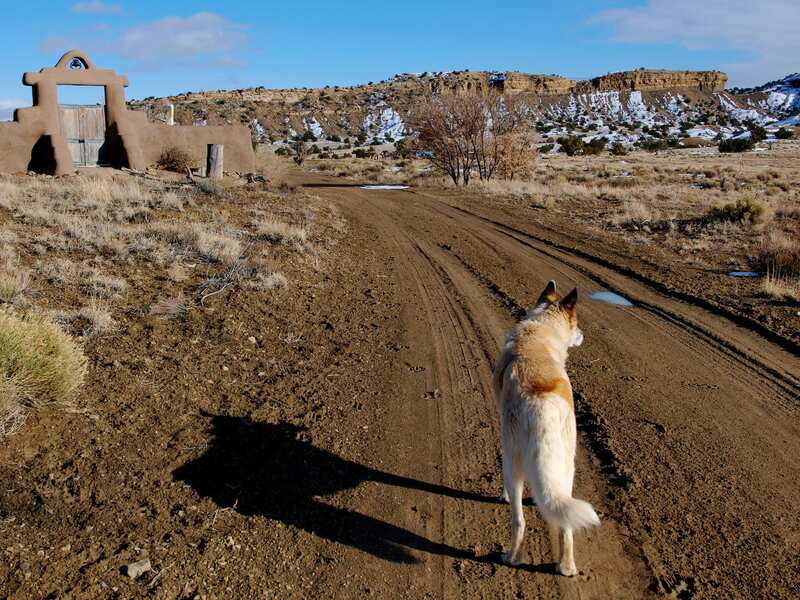 Freckles at Home- This is the only place in the world suitable for keeping a deaf coyote hybrid. 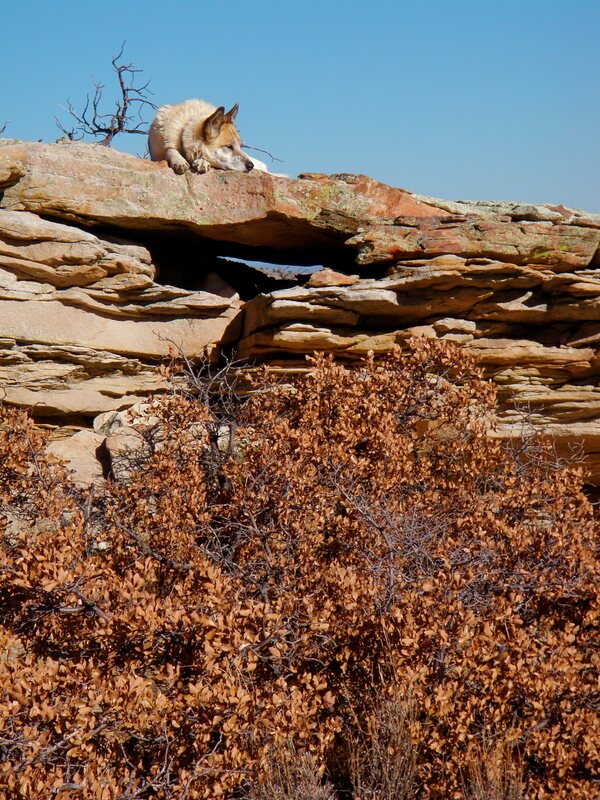 Coyote Watch- Freckles was found as a tiny pup on the mesa visible through the right hand window, likely abandoned by her coyote mother due to her congenital deafness. Freckles' Domain- Our house is that white speck in the center. She's free to roam in all this space but seldom leaves home without me. 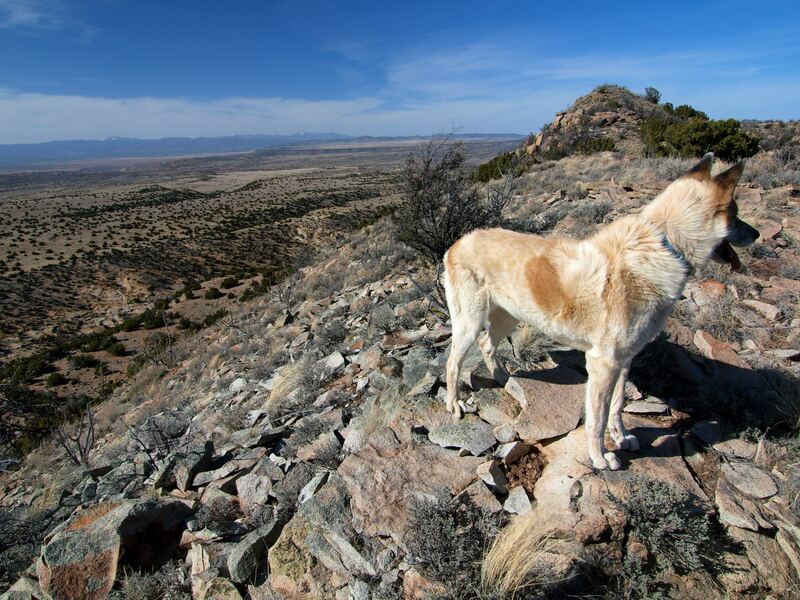 This entry was posted in Bowie & D.O.G., Hiking!, New Mexico, Photography, Uncategorized and tagged blonde coyote, coyote hybrid, dogs, hiking, New Mexico. Bookmark the permalink. this is absolutely wonderful and I absolutely adore your blond coyote. What a unique animal. Your photos are great, I am loving the landscape and the combination of browns and tans and greens against the bright blue sky. Thanks for sharing your part of the world and your pet with us! Love this story! I have volunteered to foster a deaf rez puppy from the Gallup Shelter and I’m wondering how he will do in my household. Or more accurately, how *I* will do taking care of a rambunctious little boy who can’t hear me. Any suggestions on living with a deaf animal? 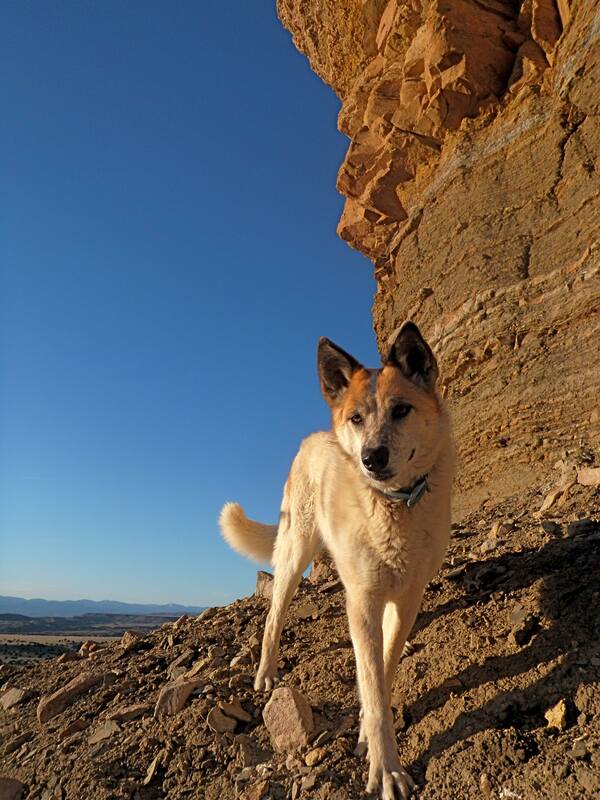 Freckles is untrainable because she’s a coyote, not because she’s deaf. You’re going to want to focus on communicating with hand signals- figure out an easy, clear repertoire and use them consistently. Freckles has never learned to sit or lay down (I’ve tried) but she knows that wiggling fingers mean hello/ good girl and beckoning fingers mean come here and that a angry face coupled with a pointed finger means she’s been bad. Being part-coyote, Freckles might be more attuned to body language and my facial expressions than most dogs, but maybe not. It might also be a deafness thing. 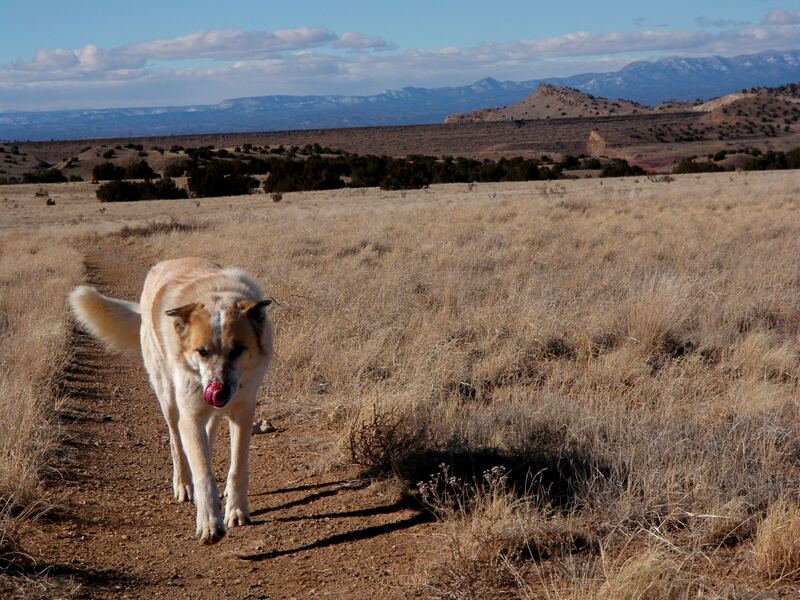 Pay attention to how your rez dog naturally responds to your body movements and facial expressions and reinforce those instincts with your training. You can also use your other dogs to teach commands like sit. Give them the verbal command coupled with the hand signal for the deaf dog and he should pick up on what to do by watching the others. I’d love to meet this rez dog! I have one myself and he’s the best dog. Good luck! All I can say is WOW! She is gorgeous! My dog (a Danish Swedish farmdog) can hear perfectly well, but he has always been more responsive to hand signals than to verbal commands. It is also interersting to see how a “handicapped” dog learns how to communicate in other ways. My dog was born without a tail, and as a result he uses his ears and his body language much more than other dogs we’ve had. A friend of mine has a border collie mix who can hear perfectly well but prefers hand signals. Tell him to sit all day long and half the time he just stares at you, but point a finger at his back end and he sits perfectly every time. Dogs are funny creatures. She is so beautiful. I have an Australian Shepherd who reminds me of her. I always wondered about the Blonde Coyote…..
Mary she IS gorgeous and very cool hearing her story. One thing you haven’t mentioned- why is she named “Freckles”? Cheers. Oh and congrats on the fresh press!!! I know I particularly liked that article. 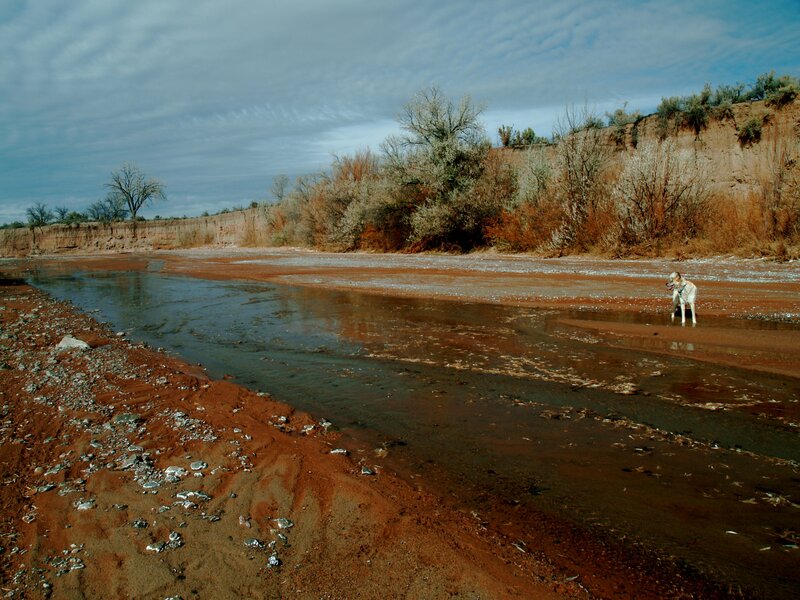 I considered myself resource conscious but having living in a water blessed area all my life it was not until I met and fell in love with the desert southwest that the preciousness (and waste) of agua really hit me hard. My lifestyle has been altered and life path redirected in part because of that first desert encounter. (Every American should experience it!) So keep speaking for Earth, Mary! 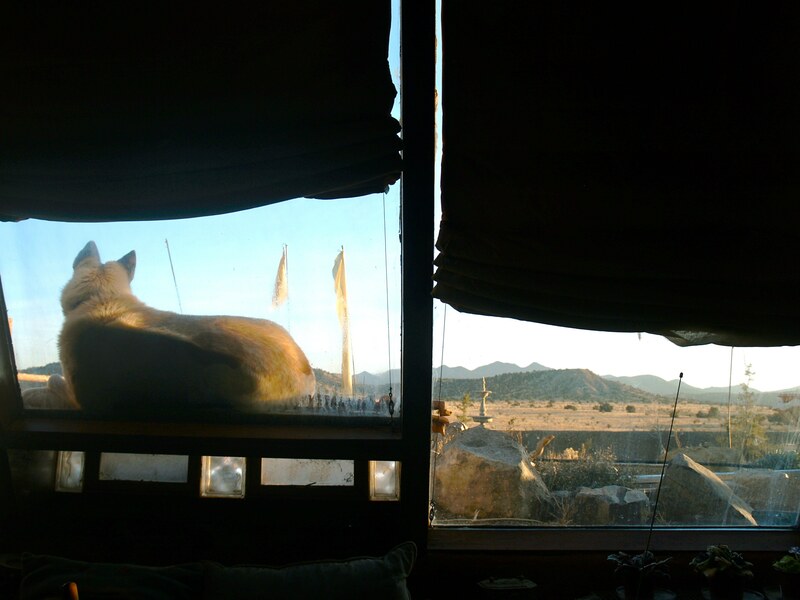 Since you don’t live at the earthship any more did you have to leave her behind there? Yep, she’s still there. I miss her, but that’s where she belongs! Thanks for explaing the Blonde Coyote name, I have wondered where you got your name from (this is the source, correct?). Love your stuff. I will be in Death Valley in March and am looking forward to climbing Telescope Mountain. Nice, Ken! Death Valley is amazing. I wrote a Travels in Geology for EARTH on DV last year. Be prepared for heat, even in March! I was there in October and it was over 100, even after dark! She’s Gorgeous Mary. Now I see why your blog is The Blonde Coyote. My dog was found abandoned high on one of the mountains here in Crete. The only male. There were three females with him all pups only weeks old. He seems a mix of Springer Spaniel and King Charles spaniel. Name is Ben. Thanks for these wonderful pictures and sharing this adventure. You are kind to not subject Freckles to cars and urban grit…her wildness is precious and should be left as undisturbed as possible. Beautiful, beautiful creature. Thanks for letting us have a look.